Garden Designers Roundtable: What is it about that container? There are two types of container gardeners in this world, those that like the containers, those that like the plants in the containers and those that like the way the containers are arranged…THREE!, there are three types of people in this world; those that like the containers, those that like the plants in the containers, those that like the way the containers are arranged and those that like the style of the arrangement… FOUR! There are four… well you get the idea, there is a lot to talk about when it comes to container gardening, and sorry for the Monty Python humor. What is it about gardening in pots that we love so much, is the pot the showpiece, or is it the plant. I must admit, that I slide between both camps with relative ease depending on the arrangement. A quick internet search for container gardening reveals a vast array of styles and plants. Take a look! 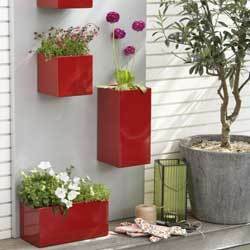 These bold red planters from Living Etc., add life and a vertical element to the garden. Simple and elegant these white vase shapes from RealSimple.com planted with grasses provide a clean look and add movement to the patio garden. Over at GroovyGreen.com wading pools are the perfect spot to grow veggies, just remember to drill holes in the bottom for drainage! And here’s our little corner of the world, and our version of vertical container gardening. So in the end, what is the secret to container gardening? Style? Substance? Effect? Fun? In a word… Yes! Now don’t forget to visit my fellow bloggers sites, for more inspirational ideas about containers! Please share some of the containers you like to use in your garden, and until next time, May all your containers be overflowing with wonder! Bloom Day for May 2010! Hey Scott – I love your vertical garden – haven’t seen that idea before. And thanks for calling me ubercool! It made my day (ok, honestly, my month). Thanks Kerry, And you deserve the title ubercool! 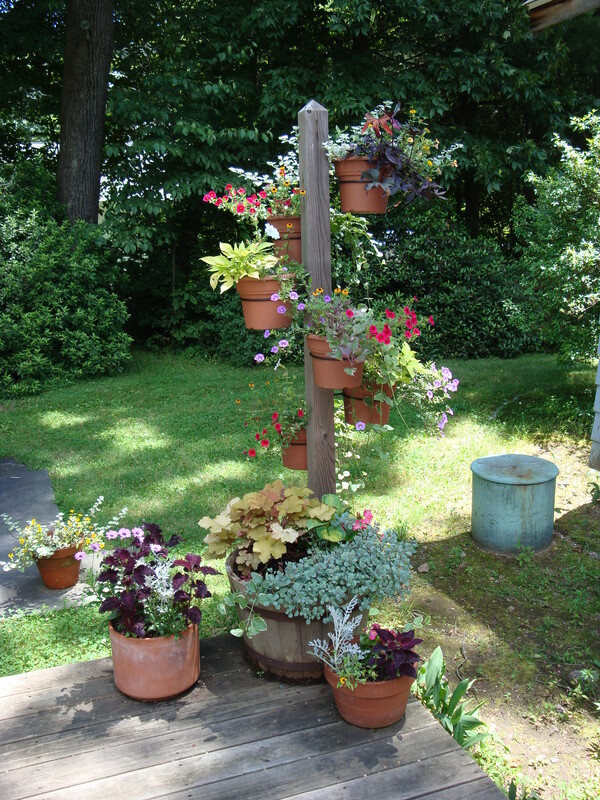 We love seeing the container ideas you come up with. I like the fact that all of these ideas are simple, yet have a big visual impact. LOVE the red containers! Well you know Jocelyn, Simple minds, simple containers! Hi, Scott — What visually exciting ideas. Great collection. Love the repetition of the red pots, and the way they’re displayed vertically on a wall. And the wading pool veggie gardens are so clever. Not sure what I think about the auto pot, but it certainly is eye-catching! Thanks Debra! I’m not sure about the auto-pot either, but it is interesting to look at. Some great funky ideas there. Thanks for the cool organisation of this month’s blogfest! Thanks Robert and Your welcome! I enjoyed your post. I could sense your enthusiasm for containers all the way over here in Western CT! Can’t wait to see your ideas, Laura! Thanks for stopping by! I really can’t decide which ones are my faves. LOVE the clam photo. I could do that here. The red containers are so striking, too. I have a neighbor that uses the pool trick. And, I’d just LOVE to plant a garden in my husband’s car. There’s enough soil in it, for sure. I really love the clam containers also, Katie. Kerry is a genius! And as to your husband’s car… well, post a pic if you plant it! I love the clam shell succulent container, but would you drill a hole in the bottom? I would think so. What a great idea though. That one really caught my eye also Pam. Really ties to our New England coastline. I’ll send a note to Kerry about drainage issues with the clam shells. Thanks for the comments! What a varied and inspiring compilation of containers ideas! 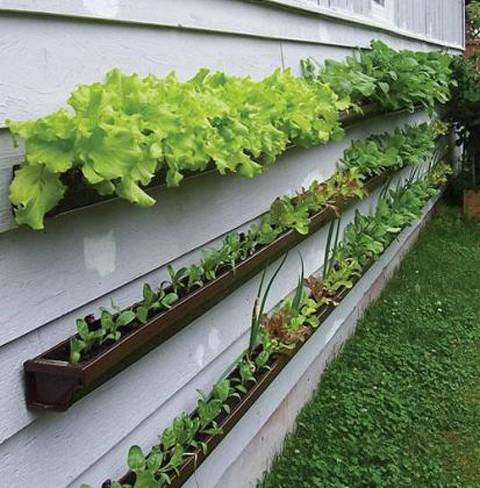 I love the idea of using gutters for growing flowers and veggies. 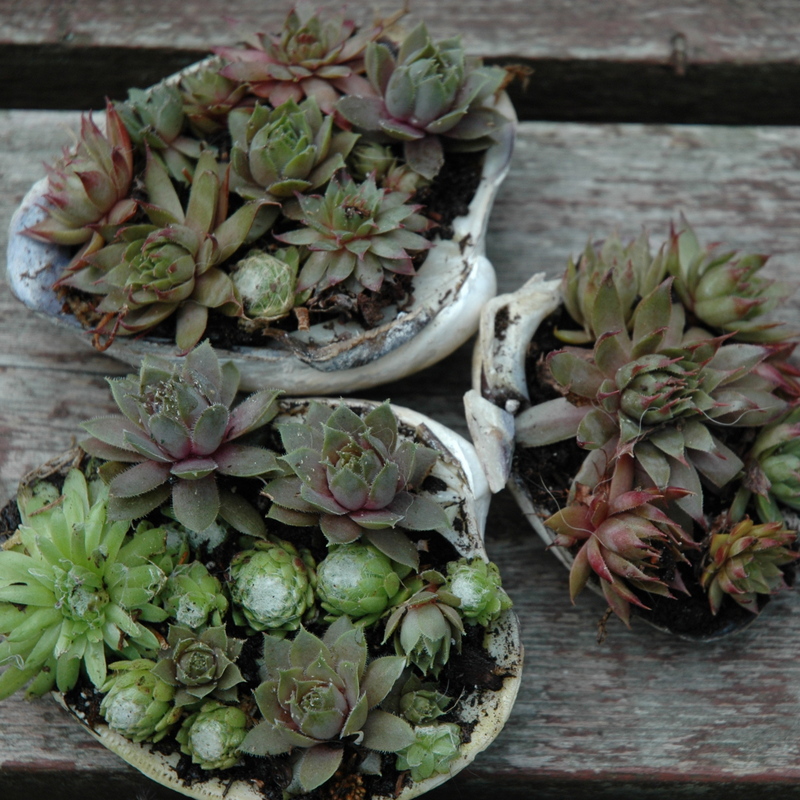 Little containers for succulents certainly are popular these days, aren’t they? Debbie, the gutter is interesting isn’t it? And yes, succulents have exploded, and for good reason! I really loved your article on containers. It was very interesting and it give me, some ideas for the decoration of my garden. Thank you. Thank you Ellada, I hope you post some photos of your containers! The Monty Python bit made my day!!! Loved your take on why we enjoy containers so much. I’m planning on making the post style container display in my own garden soon. – Thanks Scott! Thanks Christina, I don’t seem to make it through a day without a Python bit coming to mind! The posts on our deck have been a hit since we put them up a couple of years ago, and we change the arrangements each year. One day we’ll get it just right! Great container examples (and great humor, as well!). I think I love the abalone shells the best, and am wondering why I never thought of that! No…I love the wading pools the best….wait, maybe it’s the car. Yes, that’s it – the car’s the winner! I had to include the car photo Rebecca, after the posting from Flora-Grubb. 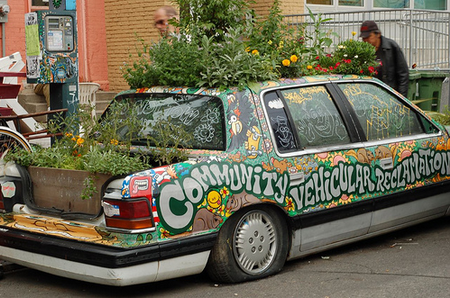 I had no idea there was even a car planting (on purpose) let alone two! Glad you enjoyed the post. Wow, Scott. I never would have pegged you for a contemporary stylist. You go! I LOVE the grasses in the white pots! And the red pots on the wall. Sometimes it’s the simplest ideas that can be the most graphic and memorable. Well done! Thanks Jenny! 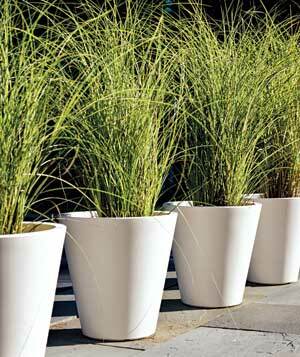 I love those grasses as well, and have tried a few in containers here. Just haven’t found the right containers for the effect. Thanks again on your leadership with GDRT. I enjoyed your presentation on the many looks and functions of container gardens. Your welcome Shirley, and thanks for all you bring to the Roundtable! And thanks for stopping by and commenting. I have decided to do a vertical gutter garden! Just this minute! I saw it via Jayme Jenkins, and now HERE … Done! Wow – now I have at least 7 different container projects I want to do! The Roundtable should sponsor a grant so that those of us who are financially challenged can make some of these wonderful ideas happen! Ivette, had I the resources, I would fund any project you wished! Unfortunately, I am challenged also. Thanks for the comments! Generally, I stay away from container pots and annuals because they require specific attention, but the simplicity of the grasses in the white pots, might just be worth it. Also the baby pool, raised bed idea would be a great inexpensive way for people with really poor soil, or no soil at all to have a garden. Great points Kari! We always start out with grand plans for the containers, but I do love the simple look of the grasses. A couple of years ago we had one Achillea ‘Coronation Gold’ in each of two elegant planters, and one Pennisetum ‘Rubrum’ in each of two others. Both were so simple, but very elegant. I think we will revisit that this year! All your examples are lovely, but I admit to being most strong to the bold, clean contemporary images at the beginning of the post. I find my eye lingers much longer when a container design uses a few architectural elements to make a strong statement. Once again, we share similar tastes! Great post, Scott, with many unusual and interesting containers. Love the veggie garden in tight spaces. I grow most of my veggies in containers as I have limited space and while they are extra work to water I find it very rewarding. Container gardening has become so popular that the garden center where I work has one department dedicated to customers that need help in selecting and planting them.